For twenty five consecutive years the Council has recognized one member of the CT General Assembly as the Family Legislator of the Year. Throughout the years members of this distinguished group have worked tirelessly on behalf of families and children in CT. Their recognition is well deserved. 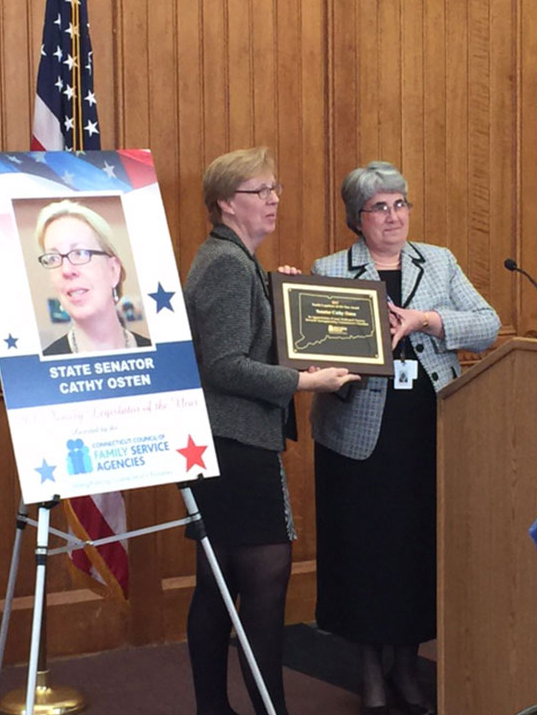 The CT Council of Family Service Agencies (CCFSA) will honor Senator Cathy Osten with their 29th Annual Family Legislator of the Year award, in recognition of her exceptional efforts to support the mission of CCFSA to strengthen Connecticut’s families. For 29 years, CCFSA has recognized exceptional public officials for consistently responding to the ever-changing needs of families in Connecticut. 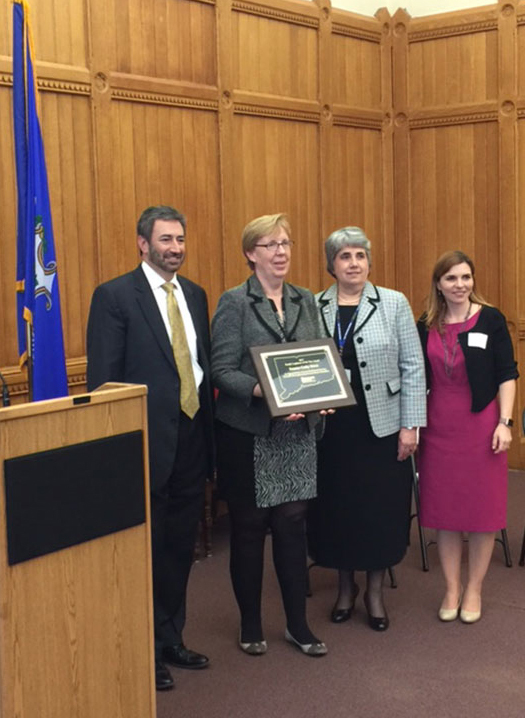 Senator Osten is being recognized for her exceptional advocacy, dedicated service and an unwavering commitment to the health, safety and well-being of CT’s children and families. Sen. Osten serves as the Co-Chair of the Appropriations Committee, Vice Chair of the Housing and Labor and Public Employees Committees and is a member of the Transportation and Veteran’s Affairs Committees. She is an advocate for family service agencies and our clients, particularly those United Services and Oak Hill which provide services in her district. In direct alignment with CCFSA’s mission, Senator Osten works to assure that families are safe, stable and strong. She is committed to supporting a high quality human services safety net, access to excellent public schools and the rights of women and seniors. “Senator Osten is a true champion for human services and in particular for the essential safety net services provided by our network of family service agencies. Despite the challenging budget situation, she continues to fight for vital programs and policies that support children and families to find hope for brighter futures. We are grateful for Senator Osten’s efforts on behalf of CT’s Family Service Agencies and the children and families we serve,” said Alyssa Goduti, President and CEO of the CT Council of Family Service Agencies. The Connecticut Council of Family Service Agencies, Inc. is a statewide network of fifteen independent, non-profit, family service agencies that deliver services to over 180,000 families annually, with the support of nearly 5,000 dedicated employees and more than 4,000. Member Agencies are community-based, licensed by the State of CT and nationally accredited. Governed by volunteer boards of directors from their respective communities, Family Service Agencies have been effectively serving CT families for more than 100 years.